Santa Fe is a sPETacular choice when you are looking for a pet-friendly destination. It is a magical land where the sun casts alluring shadows on mountains, desert and adobe buildings and the scent of pinon lingers in the crisp air. The downtown area is chock-full of pet-friendly shops, most if not all, welcoming well behaved leashed pets. A small town feel permeates Santa Fe but look deeper and you will find shopping, dining, entertainment, and cultural choices that rival major metropolitan areas! Downtown Subscription located at 376 Garcia Street is the perfect place to start your Santa Fe day. A cup of coffee, a bowl of water, and newspapers from all over the world are yours for the choosing. They open each day at 7 a.m. to the joy of dogs and dog lovers from all over town who like to enjoy their mornings together dining on the patio and watching downtown Santa Fe come to life each day. The Santa Fe Reporter readers have voted Teca Tu 500 Montezuma Avenue #116 (505)982-9374 the best upscale pet boutique of the year for three years running and after visiting you’ll know why. Featuring luxury pet accessories, supplies, and clothing as well as hosting a Pub hour once a month, serving suds, pretzels, and dog nibbles, it is one of the best pet shops we‘ve seen while traveling to over 30 states. Don‘t miss Teca Tu and be sure to call for the monthly pub night date. After a day of hiking in and around Santa Fe visit Ten Thousand Waves an authentic Japanese style bath house that offers pet-friendly private bath suites. Relax, rejuvinate, and soak away your cares and fatigued hiking muscles at 3451 Hyde Park Road in Santa Fe. Call ahead to reserve a pet-friendly private bath suite at (505)992-5025. The Inn of the Anasazi is a four-star luxury hotel is located in the heart of Santa Fe. The 58-room boutique hotel is an elegant expression of Southwestern style showcasing massive hand-carved doors, sculptured stairways and sandstone walls that whisper of prehistoric Pueblo living. So warm and inviting, PAW has awarded the Inn of the Anasazi 4 PAWS UP, it’s highest honor. You will find the atmosphere authentic and the staff genuinely happy to see you arrive with your pet. Enjoy sitting by one of the crackling fireplaces with an evening glass of wine and your pup at your feet in the common library, then retreat to your luxurious room and order a little something special from their pet-room-service menu. Our visit to the Inn of the Anasazi was delightful from start to finish! Janine Franceschi, and her 3 year old Irish Setter Beau have driven 40,000 miles, visited 30 states, and stayed in hundreds of luxury pet-friendly hotels around the country! 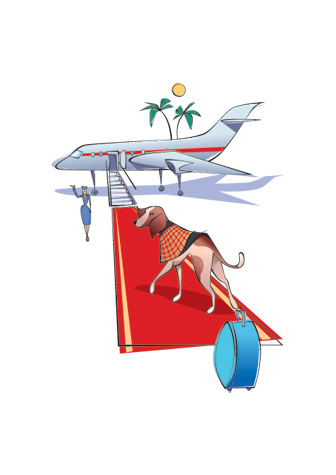 Searching for pet-friendly excellence in hotels, activities, restaurants and resources, together they source and review luxury pet-friendly hotels for PAW; Pet-friendly Accommodations Worldwide, the only online pet-friendly hotel booking engine to exclusively focus on luxury, (3-star or higher rated) pet-friendly hotels.